We've got your summer blues! We're excited to introduce our new FolkArt Color Trend: Denim. Inspired by the independence and rugged simplicity of the American Dream, the deep blues of denim evoke strength with a hint of down home comfort. Denim is comfy to wear, and these three projects bring that same lived-in, inviting warmth to home decor. This trend gives us simple techniques on how to create a unique faux denim finish on just about anything with FolkArt. The secret behind the crosshatch effect DIY on this Faux Denim Dresser is our FolkArt Home Decor Chalk Wide Brush. We love how the shimmering hardware painted with Antique Copper gives a warm glow to this piece. Pair this pillow against a white couch for maximum impact! We used a vintage batik technique to create this Indigo Stenciled Pillow, along with FolkArt stencils for a designer touch. How cool would this letter wall gallery look in a family room or playroom? Pair with pops of red or orange for a fun contrast! Don't miss our new trend! 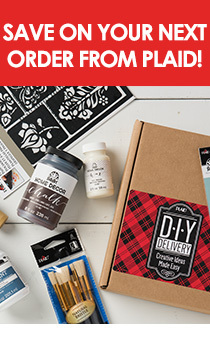 Sign up for our newsletter for the latest and greatest from Plaid Crafts!